City employees listen intently as Mayor Ken Sunseri explains about the upcoming winter weather storm threat. From left, Lakeland COO Ashley Pool, Lakeland PR Director Gerita Rye, Tim Robertson of Lakeland, Alabama Power Business Office Manager Melinda Weaver, Chris Saylor of the street department, Tim Robertson Jr. of the park and recreation department. HALEYVILLE - City departments are preparing for the uncertainties of Mother Nature, as the area has been placed under a Winter Storm Warning ahead of an arctic blast of cold air and snow which could cause treacherous conditions. Haleyville Mayor Ken Sunseri held a departmental head meeting at 10 a.m. Monday, Jan. 28, at Haleyville City Hall to address the potential of a major winter weather system that has been forecasted to bring anywhere from a half inch to three inches of snow between midnight and into the early morning hours of Tuesday. Rain will be changing over to snow between midnight and 4 a.m., Sunseri announced. "This appears to be a rapidly moving storm," he said. "The main problem is going to be the temperature." The potential is there for possible ice between late Tuesday afternoon until Wednesday morning as temperatures are expected to plummet below freezing Tuesday night and into Wednesday morning. If a shelter is needed, the mayor suggested only opening the Community Safe Room below City Hall downtown, unless there are a widespread amount of power outages. If the shelter opens, employees will need to work in shifts, the mayor further explained. Sunseri urged the fire department to make sure the community safe room is stocked with the appropriate amount of food and supplies. All city departments were urged to plan ahead, making sure they had chains for vehicles, if needed. Also, all chainsaws need to be in working order in every department in which they are used, the mayor stressed. All departments need to make sure all vehicles are fueled, chainsaws and barricades ready for the street department. If a backhoe is needed, it's at the Joint Armed Forces Reserve Center. 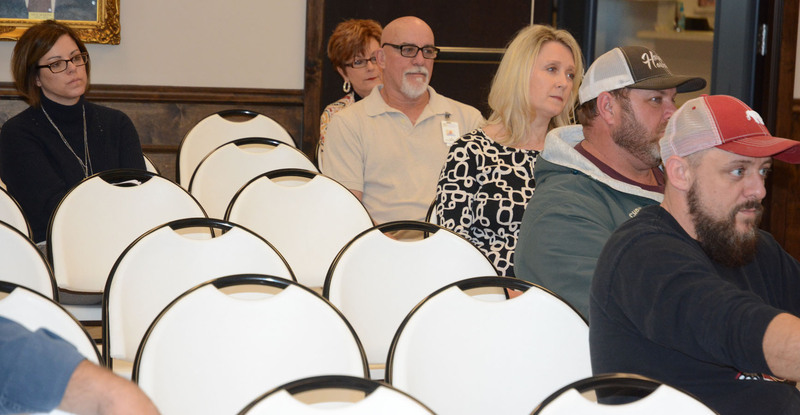 If the Alabama Department of Transportation will be working to keep Highways 195 and 5 clear, the city needs to put a priority on 15th Avenue and 30th Street, Sunseri said. Sunseri addressed officials from Lakeland Community Hospital at the meeting, stating they needed to make sure they had a way for medical personnel to reach the hospital, if the roads were treacherous. They might could request assistance from the fire department and rescue squad, the mayor said. Hospital COO Ashley Pool noted that hospital staff was on standby. If power is a problem at either the nursing home or assisted living, water may need to be purchased and taken to them, the mayor added. "We are prepared for the worst and hope for the best," he said. "We just need to prepare like we always do." The Haleyville Senior Center announced they would be closed on Tuesday, noted Director Beverly Donaldson, stressing it was too early to know yet about Wednesday, but would provide that information when it became available. "Alabama Power is not expecting any significant issues with power lines at this point," noted Business Office Manager Melinda Weaver. "Just wait and see," Mayor Sunseri concluded. The mayor contacted local businesses and informed them of the safety plan in place.